"All the brews that're fit to sip"
When I first saw this several years ago I was intrigued because pomegranate is not a flavor typically found in beer. It sounded good because pomegranates are good, but how would it blend with wheat? Of course I bought it, and with that I found one of the best fruit beers I’ve ever had. But it’s not just the fruit component that sets this summer specialty apart, but the wheat. I often talk about how, if not done well, wheat beers can taste terrible. The wheat flavor can be bitter, bready, stale and leave a lingering aftertaste. 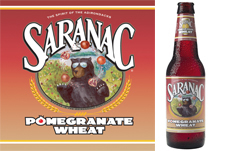 Pomegranate Wheat is nothing like that, instead using wheat how wheat should be: creamy, slightly sweet and refreshing. It’s almost like a good hefeweizen, with a creamy and subtle flavor that, in this case, is a great base and complement for the pomegranate. Very cloudy in appearance, this beer tastes like it looks, which is refreshing and soothing. The pomegranate juice hits you from the start and continues smoothly through the finish. Even though the wheat flavor wasn’t weighty to begin with, the pomegranate lifts the body and flavor more. It’s rarely too sweet and never hits you with a over-sugared flavor, instead blending very well with the sweetness from the wheat and jumping out from there. At different times of each sip the fruit juice hits you in different increments, and at some times it’s almost unnoticeable, although you know it’s there. Even though I really like this beer, it was tough deciding on a final rating. This beer shows how well wheat and fruit ales can be, and makes you wonder why some summer ales fall so short of what they could be. Many times you buy a summer ale that promises to be smooth, fruity and a have a wheaty creaminess, but it doesn’t live up to expectations, and you wish it had the qualities of Pomegranate Wheat. The fruit was never too strong and was in great balance with the wheat. But in the end, it wasn’t mind-blowing. At times you get a front end that is full of fruit, almost too much, and sometimes you don’t get enough. Sometimes it seems watery and other times has just the right creaminess. The inconsistencies can be frustrating. In the end, though, this is a very good beer and a great example of what a good summer beer should be. Just enough fruit to get you by and everything in pretty good balance, if I had to choose a fruit beer to drink, this would be it. This beer sounds right up my alley. Next time you get some, save me one. Interesting flavor choices. Sounds like a winner.